The Bonn Agreement (2001) and its successor, the Afghanistan Compact (2006) have sought to make Afghanistan one of the most centralised (or to use a post-modern term, essentialised) of sovereign nations. In the Bonn Agreement, ‘the Interim Authority shall be the repository of Afghan sovereignty’ where, ‘upon the official transfer of power, all mujahidin, Afghan armed forces and armed groups in the country shall come under the command and control of the Interim Authority’ and ‘the judicial power of Afghanistan shall be independent and shall be vested in a Supreme Court of Afghanistan.’ The Afghanistan Compact, as a successor document, was better able to identify problems that had arisen over the past five years since attempting to prosecute the 2001 Agreement - the themes were divided into security, governance, reconstruction and development, and counter-narcotics. Notions of centralised authority, state structure and accountability by oversight are Western political ideals borne from the historically observed relationship between the ruler and the ruled. In today’s world of weak states receiving foreign aid and cheap provision of debt there lies no incentive for elites to negotiate with their publics for tax revenues or feudal subordination. By contrast, in Europe, elites traditionally had to negotiate with their publics to raise money and soldiers for interstate, total war and thus forged strong central state structures (Centeno, 2002). Marx and Gramsci have viewed the state as a coercive structure, a concentrated and organized violence of society. In Afghanistan, however, Biddle has pointed out that, historically, the central government lacked the strength and resources to exercise local control or provide public goods in many parts of the country – instead, it ruled according to a series of bargains between the state and individual communities, exchanging relative autonomy for fealty and a modicum of order (Biddle, ‘Defining Success in Afghanistan’, Foreign Affairs). 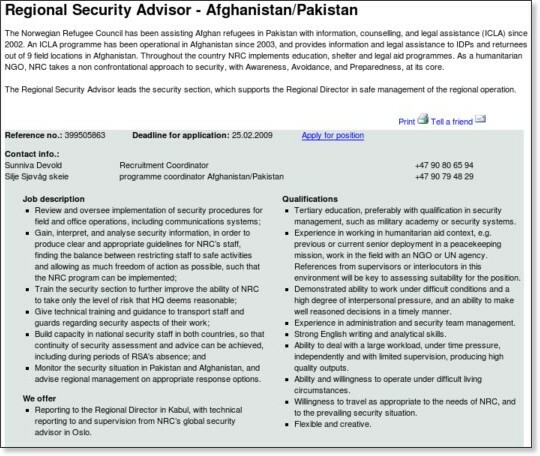 But given the willingness of NATO to prop up the Karzai regime (fraudulent elections in 2009, as noted by a colleague who was involved in monitoring) there is no traditional pay-off between the ruler and the ruled. Imposing sovereign government on a heterogeneous society is difficult enough, but the commander of ISAF forces since McChrystal’s departure, Petraeus, has altered the tactics of his predecessor (and Petraeus is likely to depart before the end of the year, leading to further tactical changes). He has stepped up the use of aerial assault in the region: air attacks at the end of 2010 saw a 100% increase when compared to the same period in the previous year. Further, in the past few months, vacated villages now mined by the neo-Taliban are at risk of being completely destroyed by air assault. United Nations statistics for the conflict present a statistical indictment of an escalation: 2010 saw 2,777 civilians killed (‘75% by the Taliban’), an 83% rise in abductions, 105% increase in ‘targeted killings’, a 588% and 248% rise in civilian killings in Helmand and Kandahar and a 21% rise in the number of child casualties. A strong culture exists where agents respond to stimulus because of their alignment to organizational values. Conversely, there is weak culture where there is little alignment with organizational values and control must be exercised through extensive procedures and bureaucracy. The latter is evident in Afghanistan. There are 2000 Afghan and 360 International NGOs working in the country (disproportionately, 34% operate in Kabul, of which one factor for this must be lack of human security across the country). The numerous NGOs working in the field are not components of the Peace Operation, which in Afghanistan refers to the 3 main international missions - the Coalition Forces, ISAF, and UNAMA. The next two years is really about security. It very is difficult to do much, other than the reforms we talked about. If you don't have a certain amount of security on the ground for aid workers, development professionals, NGOs and Afghan investors and so on, to get out and do a lot of reconstruction work that needs to be done, there has to be a minimum level of security. Kilcullen frames security within a ‘kinetic’ frame. For Baumann, dissonance in language between civilians sectors and the military becomes a problem of culture preventing shared narrative. A lead department of assimilated hierarchy that positions civilian and military within a Babelian tower is for Baumann not the answer. In complex interventions (or Phase IV operations), forging a monolithic bloc of military-civilian might is far-fetched. 1. Essentialising a tribal society requires the tribal leaders to cooperate. Since their frame of reference, indeed limits of their vision are the tribe and its geography, these leaders have no incentive to receive Kabul diktats. Cooperation requires incentives: usually this is money, supplied covertly. The C.I.A for example has employed a 30 000 strong Afghan militia that it pays and uses to hunt down militants (Woodward, ‘Obama’s Wars’). The Obama Administration bemoans corruption in the Karzai administration as it simultaneously funds shadow networks in the country. 2. ‘Counter-narcotics’ was identified as a security concern in the Afghanistan Compact (for an interesting ‘solution’ to this problem see here). Where there is a drugs trade, there is an entire shadow economy. Half the wealth generated in Helmand is from the narco-economy. Afghanistan has geostrategic value and illicit economies operate from Afghanistan into Iran; Afghanistan into Central Asia; Afghanistan into Pakistan. Globalization as a phenomenon has two distinct and contraposed narratives: the first see globalization as a developed country phenomenon that improves security prospects among developed countries, with little effect for weak states, which are more isolated. In the second narrative, globalization facilitates flows of illicit goods, such as drugs, and transnational networks such as terrorist networks, that can threaten developed countries: weak states facilitate the flow of illicit goods and serve as bases for these networks (Chowdhury, ‘Failed States’, Security Dialogue). This isn’t something that either civilian or military input can ameliorate. In the run up to the 2014-15 ‘handover’, a paradigm shift in international civilian-military engagement in the country is required. Prof Theo Farrell's authoritative account (innaugural lecture, podcast) on the war for Helmand, 2006-11, with Organizations perspective. Posen’s Balance of Power theory and Kier’s Organizational Cultures. ICOS report, interviewing 522 Afghan men across the nation to determine attitudes to reconstruction.